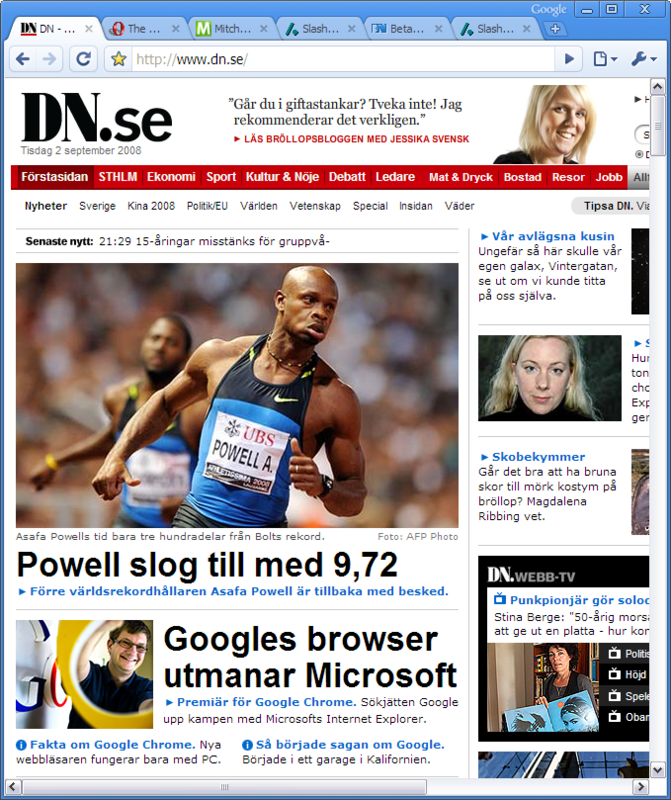 This morning I was very surprised to read that Google was just about to launch their own web browser: Google Chrome. Just now it went online so I went and downloaded it right away. First impressions are that it seems pretty solid. Not at all buggy, as the 0.2.149.27 version number would suggest. And I really like the way it looks, very sleek. Meanwhile, it’s kind of hard to say exactly what is unique about this browser. It has plenty of neat features under the hood, but not many that are obvious to the user. I guess the main selling point is the extreme simplicity of the browser. It feels very easy to use and is very easy on the eyes. For instance, there are no menus, just two buttons over to the right (like in IE7 & 8). The theme is very smooth and feels physically light. But I’m thinking this browser will need quite a marketing push from Google to get out to the masses, even if it is a very good browser. Beacause, by now, most people already have their favourite. Anyway, as many others have already said: The more the merrier in the browser wars. Posted at 19:26. Tags: Google. Categories: browsers. Both comments and trackbacks are closed.